It started as a conversation between friends and ended as the fulfillment of a dream that the residents of Eliot and Irvington get to benefit from. Kara Lammerman and Jennifer Cale have been friends for over 15 years and have pooled their energy and enthusiasm to create the warm, inviting Pocket Pub that offers a reasonably priced menu and a creative list of cocktails in a great place to sit and catch up with old friends and also get to know new neighbors. Kara Lammerman grew up in the Portland area going to Tigard high school and then working at many of the local restaurants in Portland and also in New York. She always wanted to own a restaurant but after having kids she had to put that dream on hold for a while. Jennifer Cale moved to Portland in 1995 and has lived in the Eliot neighborhood for the last three years. She has also worked in food service from fine dining and music venues to dive bars in Portland. She was working at Momo’s and Kara was working at Cassidy’s when a long term friendship was born. They first discussed opening a restaurant together 15 years ago but had to put it on hold until about a year ago when the topic came up again and the timing seemed right. After looking at a few other options that didn’t seem quite right, they saw an ad on Craigslist placed by the owner of Slice Pizza. They answered the ad, purchased the restaurant in October and took possession in November. Then they spent two months adding their personal touch to the space and opened in January. “We needed a middle of the road (restaurant). It’s one extreme or the other (here in Eliot) and we needed a kind of neighborhood, come in for a beer during happy hour and grab something to go option. I think the prices are really reasonable,” says Cale. Since the pizza ovens were already installed they kept the pizza pub concept even though they weren’t searching out a pizza restaurant. “A pizza place was the last thing I thought we’d ever do but I guess we’re doing it,” says Cale laughing. Their chef is Tim Alves who worked at Higgins restaurant so he comes with lots of great restaurant experience. They hope to open for brunch and lunch soon. Also, they are in the process of getting their liquor license for the sidewalk café seating and plan to set up some nice outdoor seating for the summer with planter boxes to enclose the space for a more outdoor patio feel. Some of the creative menu items to check out besides the delicious pizzas are the Roasted Garlic Knotts ( a nod to the cross street nearest to the pub), and the “Cale” Caesar Salad, a play on words with Jennifer’s last name. Also try the creative cocktails the Pinky Swear or Red Rum. 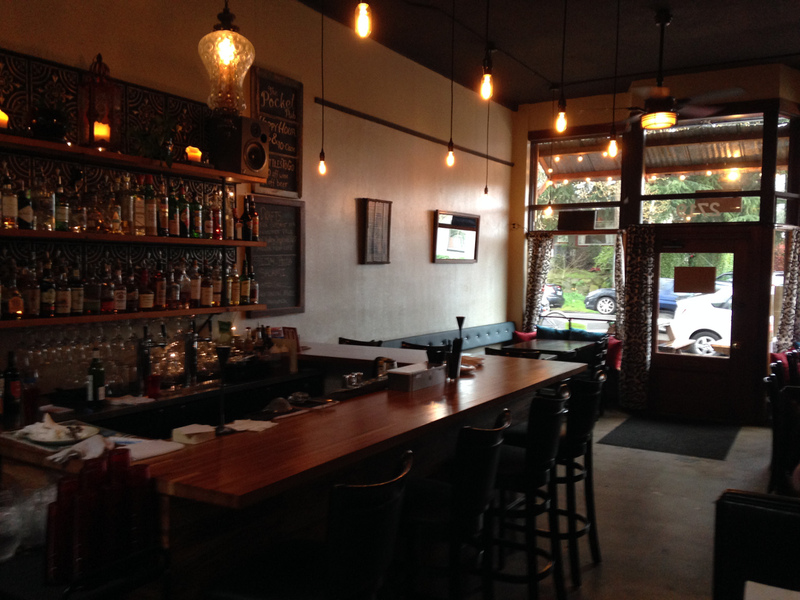 The Pocket Pub is located just north of NE Knott Street on NE 7th Avenue. Be sure to stop by soon—you’ll probably see some of your friends.